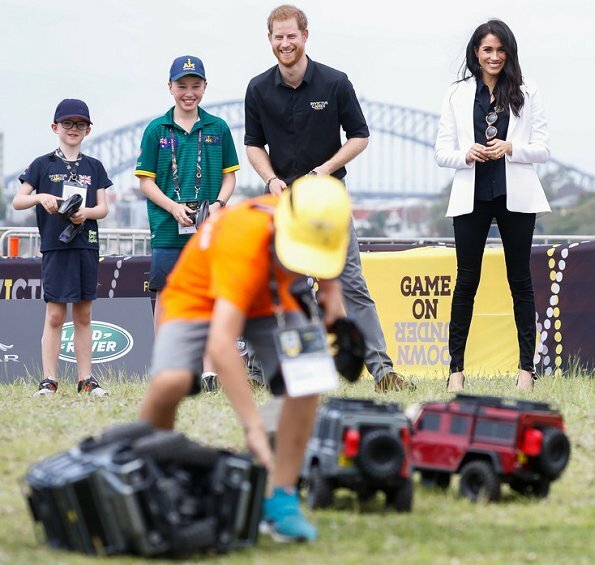 On October 20, Saturday, The Duke and Duchess of Sussex travelled by boat to attend the Invictus Games Sydney 2018 Jaguar Land Rover Driving Challenge on Cockatoo Island. 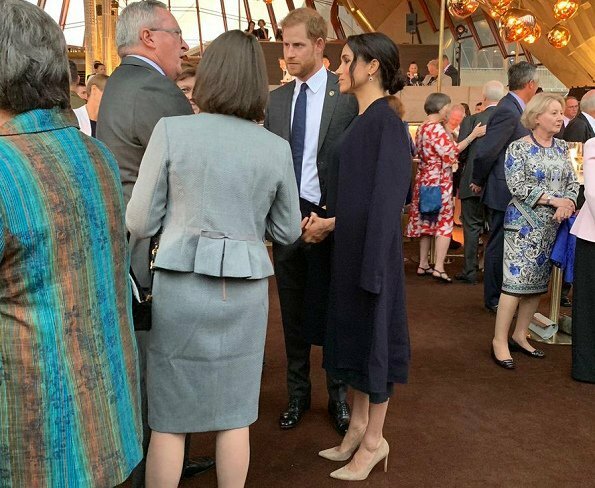 In the evening, The Duke and Duchess attended a reception hosted by the NSW Premier, The Honourable Gladys Berejiklian MP, inside the Opera House. 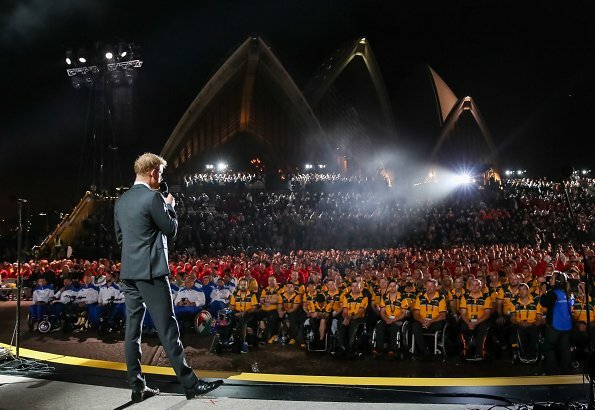 Afterwards, The Duke and Duchess of Sussex attended the Invictus Games Sydney 2018 Opening Ceremony and there, The Duke of Sussex gave a speech. The white blazer, black shirt and jeans combo is fresh and crisp. She rocks the cool shades as well. 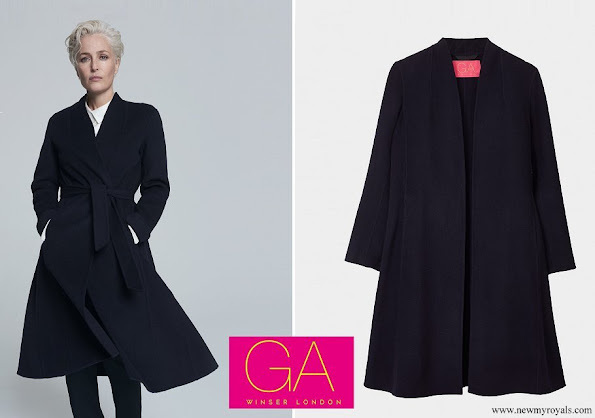 The navy dress and coat is nice as well, well fitted and I actually like the way she wore it. Fab earrings. 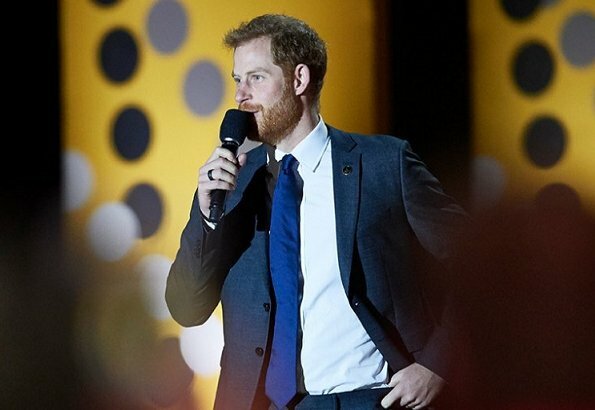 She looks good and what is much more important: Prince Harry does a speech which content was great!!! Thank you for this! Harry looks so happy to be there ! I admire his pregnant good looking wife. 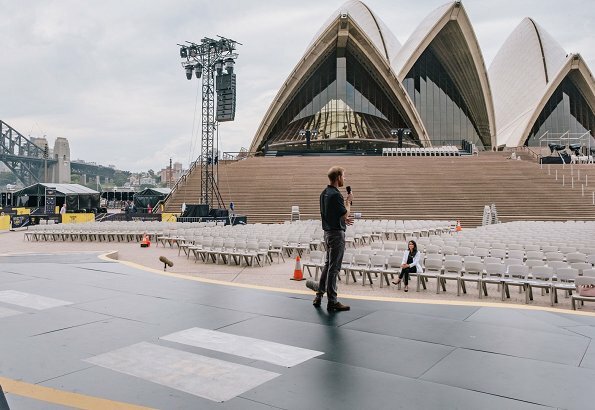 Their first week down under was a succes ! And the "uni colour" dresses she wear suits her. I cannot imagine Meghan wearing the "queen Maxima style". Nice dress, from what can be seen of it -- but the leggings/jeans (is "jeggings" still a word?") are very unflattering. 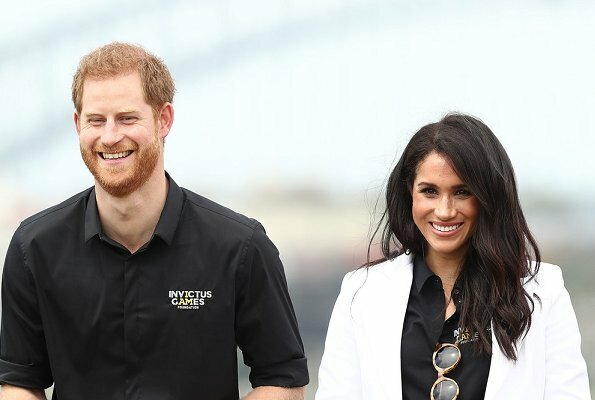 I guess the monotonous navy/black/white color palette is perhaps something that makes Meghan feel secure in the sense that she feels it is not risky? 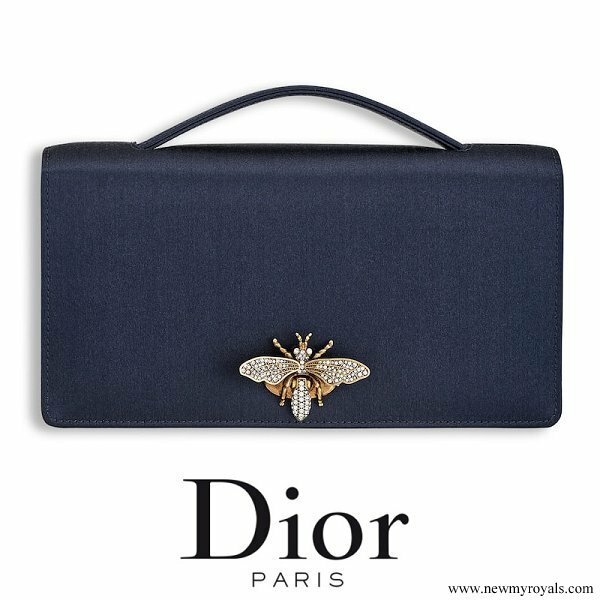 We've seen a similar preference for this palette with Crown Princess Mette-Marit. If so, I can appreciate that Meghan does not dress to shock. Her attire has been modest and dignified. some colour in Meghan's wadrope please,its all dull and not very exciting! In my opinion, colors are not the only things that makes your dress exciting. M has had quite exciting clothes even during this trip. To tell the truth, I don't think she looked particularly well in yellow, a few months back. For her I like greens, blues, greys, burgundy. She is pregnant, give her a break. Love the white coat she wore during the day. 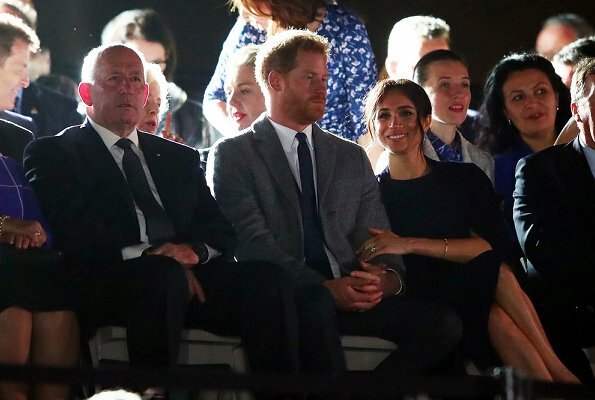 For the evening, I think meghan is wearing the blue cape dress she wore during the Queen's birthday concert, she just put a different coat over it. 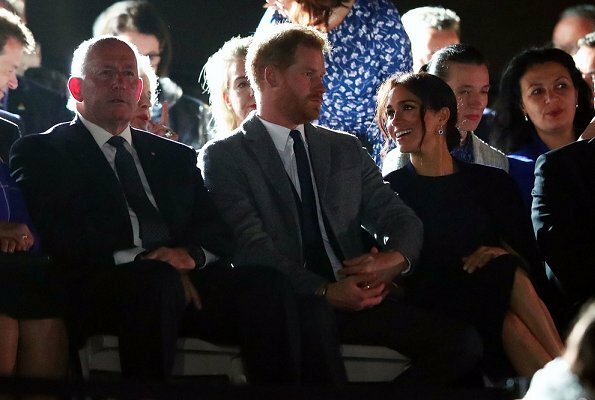 There are pictures of every royal woman sitting with her legs crossed. Sitting with ankles crossed may very well be one of those things that falls by the wayside post-Queen Elizabeth. It feels unnatural. Most ladies naturally cross their legs. Personally, I feel a lot more comfortable with ankles crossed, but that's because I am quite obese and have difficulty crossing my legs. Just the same, I think ankle-crossing is more elegant than leg-crossing. I'm at a loss as to why people are asking Meghan to wear more colors. She,like anyone else, wears clothes that works for her, and what she feels comfortable in. She might not want to wear anything too bold, she might however change as she becomes more and more comfortable in her royal role. But,for now, I think she dresses to her strengths, so good for her ! 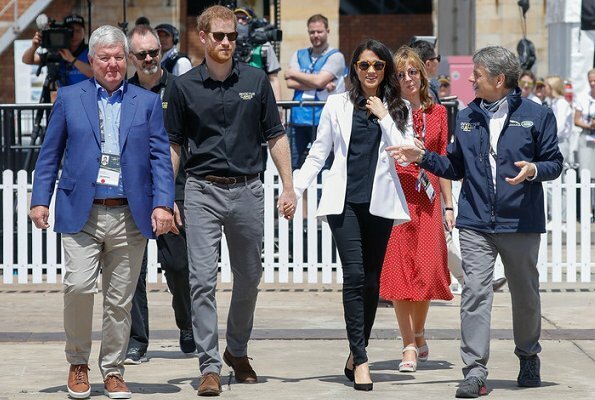 My only quibble, would be the heels with tight jeans (Kate did the same)they're not flattering, a flat shoe would have completed her casual look. My closet is mostly navy because that’s what I like and I feel good wearing it. I agree with you except for the comment about the shoes. Wearing heels with skinny jeans is fairly common, and is a preference. I can understand if it is not to your liking, but many women like it. It is a way to elevate an outfit. She could have gone with her espadrilles as well. 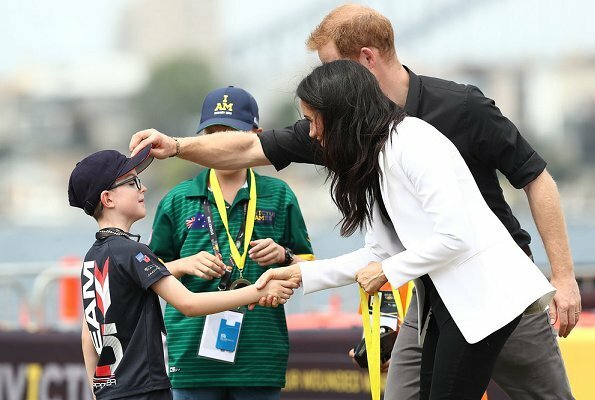 La duchesse Meghan est ravissante. Quant aux vêtements, à part quelques rares exceptions, tout lui sied à merveille. Ce couple est rafraîchissant et semble faire de l'excellent boulot. She looks good except the too much hair extensions. They look happy and really interested . 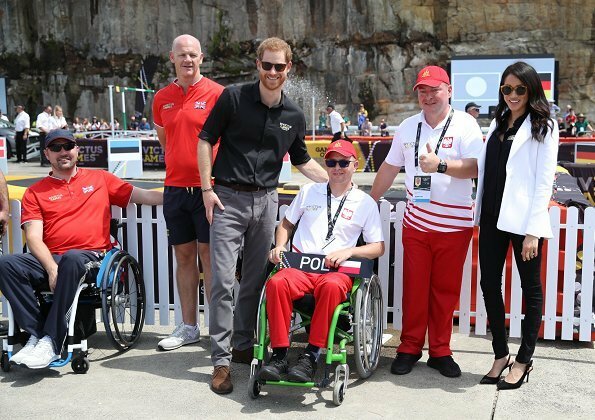 Finally the start of the Invictus Games. I wish every one great success.Love her outfits the earrings are splendid. There needs to be some understanding that Meghan the actress dressed in brighter colors for her public appearances as an actress to promote her show(s). 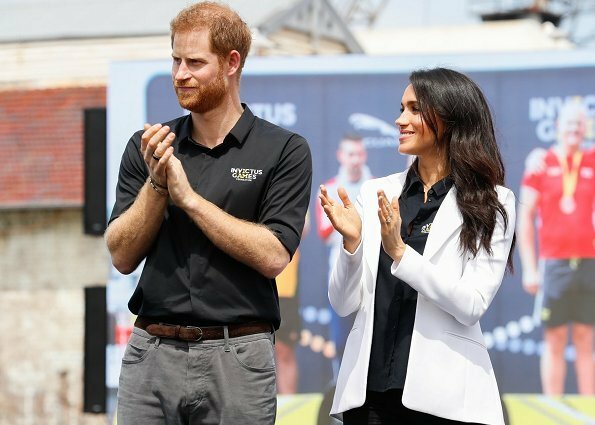 However, the real person behind the role is who we see today as the Duchess of Sussex. 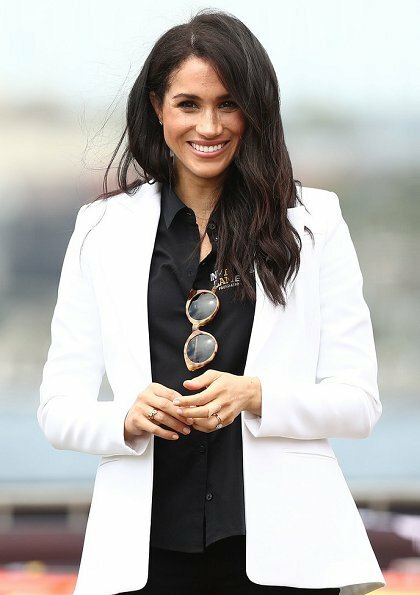 Meghan the real person prefers neutral, subdued colors and looks beautiful and comfortable wearing them. This is her authentic style and it's chic and lovely. I understand this is how she likes to dress and if she feels comfortable that's fine. But as a "spectator" I just find her style to be boring, and I don't get too excited to see what she is wearing because it is mostly the same over and over. I'm liking the black outfit / white blazer combo! the daydress.. ok, the blazer is nice and the invictus-shirt - ok, makes sense. Thank you, finally someone saying the truth. she needs some color, prints, variation. of course she does Jolanta. Her job is representing. Of course she dresses for us also. Look at the queen, she prefers to wear a lot of colors so that everybody can see her. 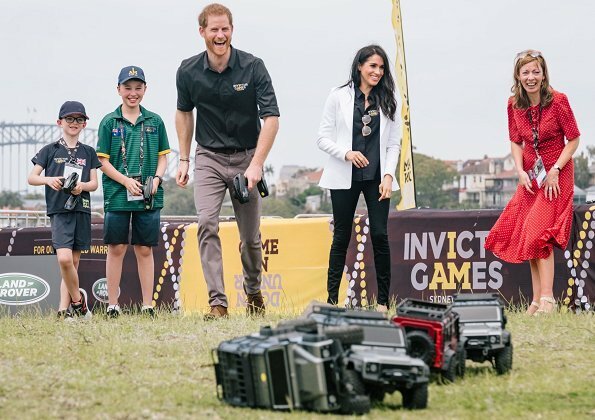 I don't say, that Meghan needs to dress so colorful, but a bit more differences in her dresses would show us the difference between all that occasions. not, like it's now, that you see a pic and have no idea from which day it is because all is so similar and boring. I love Meghan's style and the toned down colours suite her perfectly. I think she is more into Scandinavian fashion; this is how many women in Scandinavia would dress.